Botanical name : cananga odorata. Scent : fresh, floral, sweet, slightly fruity and exotic fragrance. Note : Midlle to base. This essential oil is extracted from the flower by steam distillation. Ylang ylang essential oil is derived from the flora of the Ylang ylang tree through steam distillation. This plant is a tall evergreen type of tree that is commonly found in Asia. According to folklore, this flower's name is derived from a beautiful maiden that once lived in the Philippines and her name was Ilang that means flower. This essential oil derived from Ylang ylang has a very potent sweet floral scent that induces a feeling of happiness and content. In pure form, this will instill a feeling of euphoria that may not be appropriate to all occasion types so specialists advise that this essential oil be diluted in jojoba oil and or almond oil. This essential may also be combined with another floral scent like jasmine to produce a variation. This is classified as a middle note. This is characterized by medium viscosity that is clear with a really pale amber hint to it. The Ylang ylang essential oil has a notable quality inducing a feeling of euphoria. This is effective in calming the nerves in cases of tension and stress. This essential oil component was made famous by Coco Chanel and it was mass produced under the fragrance line Chanel No. 5. This very desirable essential oil has been incorporated as well to create other unique scents and other skin, hair and other personal acre products. 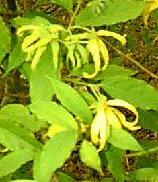 Ylang ylang essential oil was exclusively produced for producing fragrances only at one point in time. When it was further examined it was found it has notable therapeutic effects. This essential oil has a sedating effect that influences the Central Nervous System and also will help regulate adrenaline levels in the body inducing a light feeling and stress free. It has been used to pacify emotions like anger, hyperactivity, anxiety, panic, shock and fear. It is effective in treating sleeplessness, nervous tension low self-regard and also stress. It helps town down palpitations, tachycardia, hypertension, and hyperpnoea. This essential oil also has notable effects in firming the breasts. It also has the quality to balance hormonal levels, to induce the feeling of intimacy, help treat impotence and frigidity caused by stress. Additionally it may help in easing intestinal infection and diarrhea induced by stress. The Ylang ylang essential oil helps in pacifying aggression leading to a healthier interpersonal relationship with others. This essential oil helps influencing the psyche to make understanding and intuition become a dominant trait that is crucial for improved relationship with other people. It is common that men retaliate from sweet scents naturally so if this happens you may have to reduce the amount of essential oil use to make it smell like it is just laced with it. This essential oil's scent will paint a live picture in your mind showing flowers and almonds. Their scent intertwined producing a very relaxing ambiance. It has a quality that stimulates the endorphin releasing part of the brain that is also known as the happy hormone that will help reduce sensitivity to pain and increase the intensity of the feelings relating to intimacy and euphoria. It has the notable effect classified as antidepressant that will come in handy for those people often exposed to stressors. Additionally it is antispasmodic and sedating similar to Valerian. The scent make the feelings of angst and other negative emotion dissolve and juts be carried away to the depths of nothingness. Another effect this essential oil has is its ability to induce relaxation to the facial muscles where all the expressions are channeled. May cause sensitization, headaches and nausea if used in excess. Used carefully if you have low blood pressure.